'Over the Hills/Dros y Bryniau' - equally at home in mid Wales as in Northumberland, the shepherding life being much the same, it is 25 years since Kim's first picture book was published and this delightful show ran at Tatton Park Farm through the summer of 2014. Followers of traditional country life appreciate the authenticity and loving detail of Kim's work, engaging young children in real country life without being in any way sentimental or twee. These are classics of the genre which are now part of the national curriculum, a kind of primer for top selling volumes like James Rebanks' 'The Shepherd's Life'. This exhibition is beautifully curated and consists of 13 original coloured drawings plus preparatory work, storyboards and models that tell the stories behind the stories. Signed copies of the picture books (in Welsh as well as English) are also available. So if you live in mid Wales, or will be visiting the area this summer, take time out to visit Pen'rallt, run by the wonderfully enterprising and hardworking Diane and Geoff. Their well laid out venue on the main street offers an extraordinary collection of new and quality second hand books, with a specialist line in photography and the arts. Mac's a lively thriving town with great community spirit so is always worth a visit! Just a few doors up from the Museum of Modern Art on the A487. Opening hours: Sat 10-4:30, Mon/Tues/Wed/Fri 10-6. Phone 01654 700559 or email penralltbooks@gmail.com for further info. The exhibition room held 12 pieces of Kim’s original artwork and transcripts from her books, including Floss, Emma's Lamb, Just Like Floss and The Shepherd Boy. Children loved following the Little Baa trail around the farm, dressing up as shepherds and having their photo taken with Ma the sheep. There was lots to learn about the wonderful work that sheepdogs do on farms and even more fun to be had looking for Floss's mischievous puppies which were hiding in the Maize Maze! Other activities included regular talks on the farm's livestock, milking demonstrations, storytelling sessions (weekends) and the opportunity to meet our newly hatched out chicks and ducklings. Visit the Tatton Park Farm website for more information. 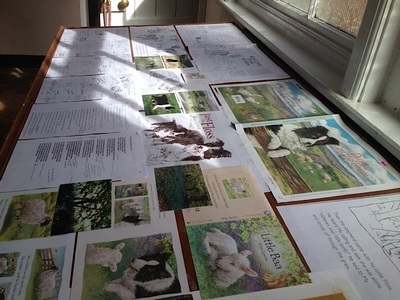 The work of Kim Lewis resulted in the touring exhibition Over the Hills and Far Away – Tales from a Northumbrian Farm, organized by Seven Stories, The Centre for Childrens’ Books based in Newcastle upon Tyne. 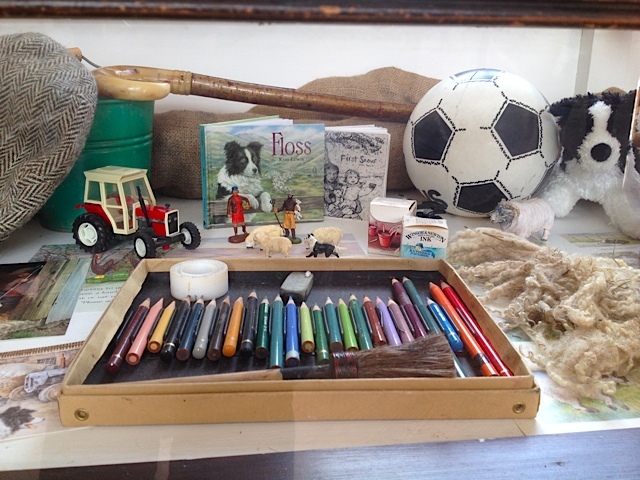 Visitors to the exhibition were able to step into a ‘farmyard’, explore the farm year with Kim’s sheepdog, Floss, and try their hand at being an author and illustrator in a recreation of Kim’s studio. Storyboards, photographs and sketchbooks showed how she turned her family’s farm, along with the animals, people and places she knows so well into the pictures and stories we love. Seven Stories also organized the Over the Hills and Far Away Roadshow, a travelling book playground for young children and their families which toured schools and village halls in the North East England in 2003, bringing Kim’s books to life through storytelling, games and creative activities. Later, Kim donated several of the exhibited books, with all the supporting material, to the permanent archive of children’s literature at Seven Stories.